RICHLAND, Wash. – From spoken word to song lyrics, the Urban Poets Society welcomes all forms of poetry to the free, public open mic at 7 p.m. Friday, April 4, in the East Building auditorium at Washington State University Tri-Cities, 2710 Crimson Way, Richland. The evening is part of the College of Arts & Sciences 2014 Season of Events. The next open mics at WSU Tri-Cities will be on first Fridays – May 2 and June 6 – at the same time and place. The society is as much a youth leadership organization as it is about poetry. 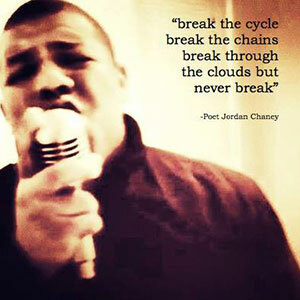 It was created in 2013 by Jordan Chaney, a spoken word poet based in the Tri-Cities who has a passion for helping youth find their voices through the power of language. He has been dubbed the “Poet Laureate of Northwest Wine Country,” with poems published in Wine Press Northwest magazine. He teaches “Speaking from the Pen,” a poetry and communication skills workshop, at the Benton-Franklin Counties Juvenile Detention Center and at alternative schools. He is the author of two books: “Double Barreled Bible: A Poet’s Quest for the Almighty,” a collection of urban poems that blends Eastern and Western philosophies; and “Rocket Fuel for Dreamers,” a collection of poetry written to inspire, uplift and motivate. “Mighty Peasant” is his 2011 album of spoken word poems. The Urban Poets Society holds open mic events several times each month throughout the community, encouraging poets of all ages to participate, share and hear. Learn more about WSU Tri-Cities and its dynamic community engagement at http://www.tricity.wsu.edu.